Water is a precious asset which is essential for all our activities, and plays a vital role in life and all living things. This natural resource, so familiar to us, is in fact becoming less secure; while water covers 70 % of the surface of the earth, fresh water accounts for just 2.8% of this. Most fresh water is found in a solid state, in the form of glaciers, and only 0.01 % remains directly useable by man. Furthermore, water is distributed in very unequal fashion across the planet, with 60% of fresh water reserves being concentrated in just 9 countries. Consumption levels have risen continuously since the beginning of the 20th century and are unevenly distributed (600 litres per person per day in the United States, 250 litres in France, and just 10 litres in some African countries). For us, who take running water for granted, it is important to recognise its value and always give it the respect it deserves. Saving water enables conservation of resources, reduction of the cost of water sourcing, transportation and treatment, energy saving and less pollution. The ECODO system is a leakage detector which allows you to prevent water damage, imperceptible and unpredictable leaks, and floods due to leaking pipes. To prevent nasty surprises in your water bills, it is essential to detect leaks in order to have them repaired quickly and therefore pay only for the water you actually consume. When leaving home, the device can be switched on at the touch of a button. In the event of a leak, the ECODO leak detector will send a signal to its motorised tap and automatically close off the arriving water! 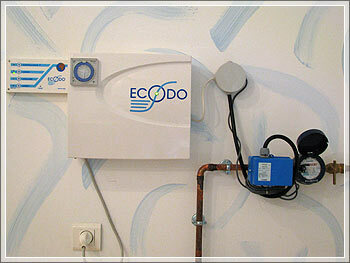 To know more about the use and the installation of the ECODO system, contact us from now on! • Save water, which is a natural asset necessary to our survival, and which unfortunately is unevenly divided across the world. • Save money by only paying for what you actually consume, since "ECODO" detects the slightest leak on all your sanitary devices and on the pipes linked to the meter. • Avoid any water damage in your apartment, house, camping-car or caravan: the detector can be installed in any living space. 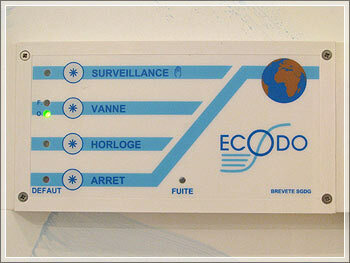 • The "ECODO" detector is certified by the French state and recognised as an energy saving item, meaning that you can benefit from tax reduction and a VAT rate of 5.5% if the installation is carried out by a company. 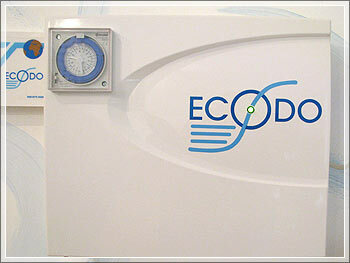 • The "ECODO" detector is very simple to use. For all private installations in apartments and houses. 1) Choice of either manual or cyclical monitoring. 2) Control of leakage volume: 1 litre, 2 litres, 3 litres, 4 litres, 5 litres or 6 litres, in the case of obligatory power supply (eg. refrigerator producing ice cubes). 3) Remote control of valve opening and closing. 4) Stoppage of monitoring mode. Example: Programmed for 1 litre. 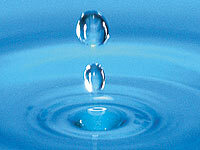 • In the case of a drop-by-drop leak every second, the volume of 1 litre will be reached in less than an hour. • If the leak is significant, the litre will be reached rapidly. In manual monitoring mode or in clock mode, when a leak is signalled the valve closes and a beep sounds for two minutes. Simply stop monitoring mode and the valve opens once again. Meter + valve + servomotor = approx. 28 cm. Power supply of electrical box in 220 mono, wire connection between the box and the 12 volt meter. A single back-up battery for approximately 10 hours of operation (opening and closing valve) can therefore largely compensate for 10 days of mains failure. Motor warranty: 5 years (life span: 20 years minimum). Temperature between – 15° and + 50°. Risk of damage to motor and printed circuit: lightning. • Can receive instructions from a negative temperature sensor in the event of frost. • Has a dedicated information output for remote control: monitoring station or other (internet). • Can provide remote control closure of a valve or alarm. • Can be used for an industrial complex (for example, colleges, sports halls, schools, community centres, sports centres, stadiums, etc) In short, all buildings with a single meter. The latter can be dealt with by either the closure of a Ø 50/60 valve or by an alarm. 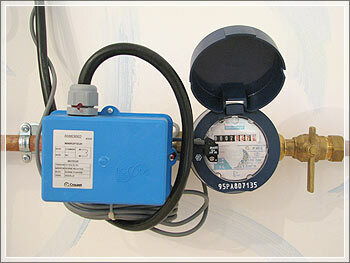 • Can also be used for swimming pool supplies with control of consumption. • Should never be used to order the closure of a valve when the buildings to be controlled are equipped with RIA fire protection system. • Must be installed by professionals in accordance with best professional practice.